Every Seaboard now comes with an even larger and more powerful package of software. Starting today STROBE2, the award-winning $179 software polysynth from FXpansion, will be included with every Seaboard RISE and Seaboard GRAND along with Equator. With a sophisticated analogue modelling engine, a superb effects section, an easy-to-use preset library browser and compatibility with Multidimensional Polyphonic Expression (MPE) instruments, STROBE2 is a must-have for music producers. It recently became an even more powerful tool for expression after adding over 200 new preset sounds designed for 5D Touch on the Seaboard. Watch the video above and see how you can create incredible electronic soundscapes when you combine the expressive control of the Seaboard with STROBE2's array of synth sounds and effects. Listen to some of the 200 new STROBE2 presets designed for use with 5D Touch in our second video. Now is the best time to buy a Seaboard and its industry-leading collection of software tools: Equator, Bitwig 8-Track (for RISE), and now STROBE2! 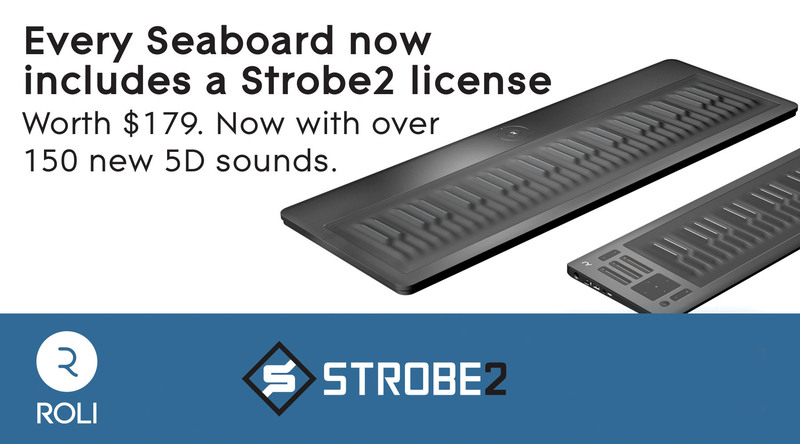 View an in-depth tutorial on using the Seaboard with STROBE2 in the video above.